Lay back and enjoy the summer, skate the half pipe, cruise the flea market, jet to the coast, stay out all night at the rooftop barbecue. 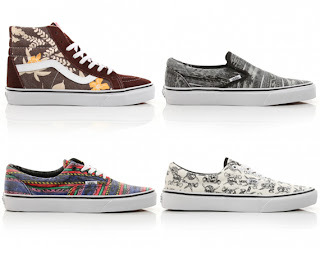 Whatever your plans for the summer it seems that the Vans camp has got you covered. Their latest offering of printed sneakers inspired by the classics started by the Van Doren clique many moons ago is a 'summer make you smile' pack. These four shoes designed by Steve Van Doren is sure to leave their cool print imprinted on your summer swag this season. Available now at various Vans dealers and at Dave's Quality Meats online shop.